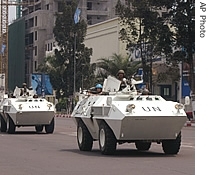 United Nations and European peacekeepers have evacuated a group of diplomats who were trapped by gunfire between forces loyal to Congo's top two presidential candidates. The tension in Congo remains high after the results of the announcement of the first round of elections. Foreign diplomats, who had been visiting Congo's incumbent President Joseph Kabila's main rival, vice-president and former rebel leader Jean-Pierre Bemba, were trapped when a fierce gun battle broke out outside his home Monday. A U.N. spokesman said U.N. and Spanish troops rescued them in armored vehicles and drove them to safety in the U.N. base. The diplomats from major donor nations had been trying to get Bemba to agree to a meeting with Mr. Kabila. Among those evacuated was William Swing, the head of the 17,000 strong U.N. peacekeeping force in Congo. Since the official results for Congo's elections were declared late on Sunday, soldiers loyal to Mr. Kabila have been locked in fierce battles with those backing his strongest challenger, Bemba. The first attacks were aimed at the headquarters of the Independent Electoral Commission itself. Its spokesman Delion Kibumlumpu says he does not know who the attackers were or why theY targeted the commission. He says, he does not understand and adds the commission was attacked just minutes after the provisional results were announced. The results showed Mr. Kabila won 45 percent of the votes in the July 30 presidential ballot, falling five percent short of the minimum for outright victory. Bemba obtained 20 percent of the vote, and the rest was divided among 31 other candidates. The two front-runners will face off in the second round scheduled for October 29th. Mr. Kabila sounded optimistic about the run-offs. He said on television Sunday he has no doubt that he will consolidate his lead and win in the second round. Bemba's supporters, while claiming the first round was marked by fraud, also sounded optimistic, predicting victory for their candidate. The presidential elections were Congo's first in four decades. Many observers caution that, rather than uniting the country of 58 million people behind an elected leader, the elections will polarize the country.